Venerable Kelsang Chitta Karuna, was born in Indianapolis, Indiana in July of 1963. She received her undergraduate degrees in Special Education, and Child Development in 1986, from Central State University in Wilberforce Ohio. In October of 1987 Ven. Chitta moved to Los Angeles and began her teaching career in preschool education, and in 1993 she started her own private school for physically and mentally challenged preschoolers. Looking for a meditation practice to supplement her rich spiritual background she came across path of Tibetan Buddhism. As she continued in this practice of the Tibetan tradition, she took Ordination in 1996 as a Getsulma (novice) in the Gelug School. In August of 2000 Ven. Chitta moved to International Buddhist Meditation Center in Los Angeles, and began holding introductory classes in Tibetan Lam Rim, guided meditation, retreat, and traditional ritual practices. In 2001 Ven. Chitta began to travel throughout rural parts of Asia including mainland China, outer Mongolia (Ulaanbaatar), Korea, and Taiwan, teaching English, computer skills and beginning meditation. In 2005 after the devastating tsunami in Sri Lanka, Ven. Chitta moved to the island for over one year to work in an all girl orphanage. Ven. Chitta received her Master's and Doctorate degrees In 2003 & 2004 respectively, from the College of Buddhist Studies Los Angeles, in Buddhist Philosophy and Psychology. In 2004 Ven. Chitta received her Bhikshuni Vows at the IBMC's grand ordination, under the Abbess Ven. Dr. Karuna Dharma (the first American woman to be Ordained as a Bhikshuni in the West), becoming along with the other 22 Tibetan nuns, the first linage holders of the new lineage Bhikshunis called 'The Karuna Bhikshunis'. This group of Bhikshunis are the beginning of a new line of Western Bhikshunis destined to revive the Bhikshuni ordination in the Tibetan tradition and especially in the west. Bhikshuni Kelsang is among the first Black American females to be ordained in the Tibetan tradition and the first Black American female to be ordained as a Bhikshuni in the Tibetan Gelug school. In November of 2004 Venerable Chitta was chosen by Ven. Dr. Karuna Dharma as the president, provost, and operating director of the College of Buddhist Studies, and she redesigned it as an online Buddhist studies program, and thus the program was renamed the Buddhist Studies International - Los Angeles. In February of 2012 when she began preparation for her three year retreat. Ven. Chitta Named Ven. Wanji Sunim. as the President and director of Buddhist Studies Institute - Los Angeles. Ven. Wanji integrated BSI-LA into his ongoing, established, online Buddhist University "Buddha Dharma University." Ven. Kelsang Chitta Karuna, completed her 3 year retreat! She was the Vinaya Master, in charge of training of novice monks. The Dharma Seal Temple closed due to lack of funds. in January of 2016. Venerable Chitta Karuna, is President Emeritus of her long-held College of Buddhist Studies - Online University, which was first established in 1974 by Ven. Thich Thien-An in Los Angeles at International Buddhist Meditation Center. Ven. Thien-An created a Universal University that incorporates all schools of Buddhist study and practice. He dreamed of a University that would be spread across all of western culture and diversities. The College of Buddhist Studies, is meant to have many extensions. Therefore, we are all united, in instruction, and sharing the precious teachings of The Buddha. -Buddha Dharma University- International Buddhist Meditation Center, and College of Buddhist Studies- Online. are all Subsidiaries and extensions of Ven. Thich Thien-An's Vision. Ven. Karuna returned to her Palmoling Hermitage in the Ohio Appellations, for 7 months, to await the next phase of her incredible life journey! Venerable Karuna became a Resident Monastic at Heartwood Refuge in North Carolina a beautiful retreat center in Hendersonville. Ani Chitta was director of Residents and Volunteer coordinator. And also the Coordinator of the Organic community meditation garden. In October of 2012, when, Ven. Chitta Karuna began her 3 year retreat in the remote land of the Gobi Desert, on the Steeps of majestic Mongolia at Ganden Monastery, she was under the direction of Venerable Thuksay Tulku Rinpoche. When Ven. Kelsang Chitta Karuna, completed her 3 year retreat, she became qualified to carry the name 'Lama' meaning Teacher. Asked by local students in the Hendersonville area, to guide them on the Dharma Path she became the teacher at Open Mind Sangha. Due to lack of financial support, the Open Mind Sangha, as a physical space, was disbanded. 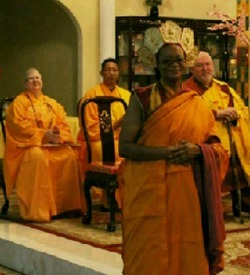 This development led Lama Chitta Karuna, to re-entered the world as a retired Lama, creating her Palmoling Hermitage, in Hendersonville & to live more fully the teachings of the Buddha Dharma, holding & applying her Vows by holding Right Action and Right Livelihood more fully in an active, non-monastic community, and continuing to guide all Mother Sentient beings as needed on a one on one basis.